Escape rooms have become a popular form of group entertainment but how does setting one up in a classroom promote executive functioning skills? In Rochelle Rubin and Nicole Goldman’s Green Cluster class, students have been studying various facets of executive functioning as part of their Student Advocacy curriculum, including time management, task initiation, and organization. “I constantly draw attention to these vocabulary terms as the students are using them,” said Ms. Rubin. 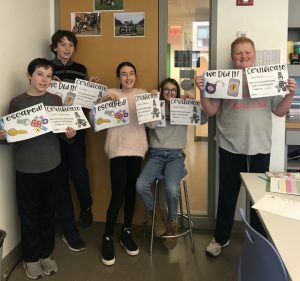 “For example, when a student writes down an assignment in their planner, I praise their strategy for organization.” Wanting to find a way to review the terms related to executive functioning while actually having the students utilize the various skills, led to the idea of an escape room. According to Ms. Rubin, the activity fostered collaboration and allowed students to practice skills in the real world. They had to organize their ideas and process in tandem with physically organizing the clues, as well as pause, reflect and communicate with their group before attempting to solve a clue which practiced inhibitory control. The students were given a certain amount of time to complete the activity, so they split up tasks in order to meet the requirements of the challenge and consistently checked the timer to make sure they were working at a successful pace. At the end, they had to recite a deciphered message to unlock the door. Both groups were successful and were extremely motivated to complete the challenge. “We were impressed by their teamwork and perseverance, and we know they felt proud of their success,” said Ms. and Goldman.